Every war of any significance over the last 500 years has been a psyop for Jews. They admit it in their protocols and speeches to other Jews when the goyim aren't supposed to be listening and until you get a hand around that fact, you, dear reader, will be an easy target for Jewish misdirection and fake saviors they continue to place in front of you as part of their con. The system within which he operates I call masonic. 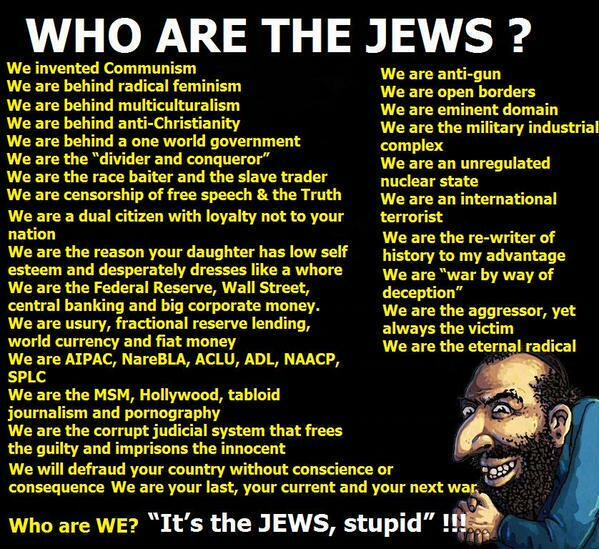 Judaism is a secret society at its heart and it has gained control of masonry-like organizations as well as cults and religious branches, while creating the "liberalism" that is used to then, create the democracy, one man, one vote, so easy for those with too much power to control...Hitler saw the Jew behind slavery, colonialism, most exploitation going on while, interestingly, he took an area of political thought actually invented by Jews but did what the Jews never intended, follow through with the goods and make it work. He went about putting in good people to implement socialist policies that forced the rich and powerful to cow-tow to the will of the state when in conflict. He had quickly had the most successful economy in the world when just a few years before, the whole country was in the poor house. His success came from his desire to truly serve and lead the people he ruled getting an aware people who had the nation's best interest at heart to implement policies.At the same time, he removed all of the Jewish roadblocks and though Jewish power was diminished, Jews as a body still were better off than the gentile body they lived next door to. Bingo, Germany climbed to the top in a couple of years from barely scraping by while earning the respect of many great men who also saw the corrosive Jew evil seeking more and more control. Men like Joseph Kennedy, Charles Lindbergh, Henry Ford, Mahatma Gandhi and the English king who was quickly dethroned by the real leaders of England, the Jewish bankers....There were good reasons why most exploited third world countries decided to fight for Hitler if Jewish control had not seized too much control over them by the start of the war. So, though it is possible that bankers allowed Hitler to rise the question of why the Bolsheviks would be utilized in their attempt at takeover must be adequately answered. Did bankers turn their Bolshevik, lower Jews into pawns and enable both sides to fight each other for some Hegelian dialect reason or were they really trying to overthrow Germany with communism as they looked for their best way to expand their Jew World Order and didn't think Hitler could stop them? That failing and Hitler succeeding, did they implement another protocol from their protocols? They foresaw the issue in Protocol 7 and Hitler became that issue? then we must offer resistance by a universal war. I wonder why they wouldn't mention this three world war plan if it was cemented into the ground as of 1897? No, I think I will go with Hitler being real resistance to the Jews, a man who got many nations to follow him so we had to have a, Jew forced, world war to rectify...As I repeat often about the racist obsessions these days. 1940 was the year to fight for your white homelands and get behind Hitler. Whatever it is you are doing now, is being implemented behind the curtain and through his agents in the arena. The Anglins, Aurenheimers, Jones, Ickes, fake terrorists with the deliberate exacerbating of tensions from MSM I and II, are their tools to accomplish the implementing. Had Hitler won, had most of the world not followed the Jews and seen the good in Hitler instead, what a wonderful world this would be and I wouldn't have this website up. I believe I need three dragons please!